Happy Friday! I wanted to do a post before our road trip this weekend to see my family in PA. I ordered this fan floral clean tee after seeing it on a LOFT associate. 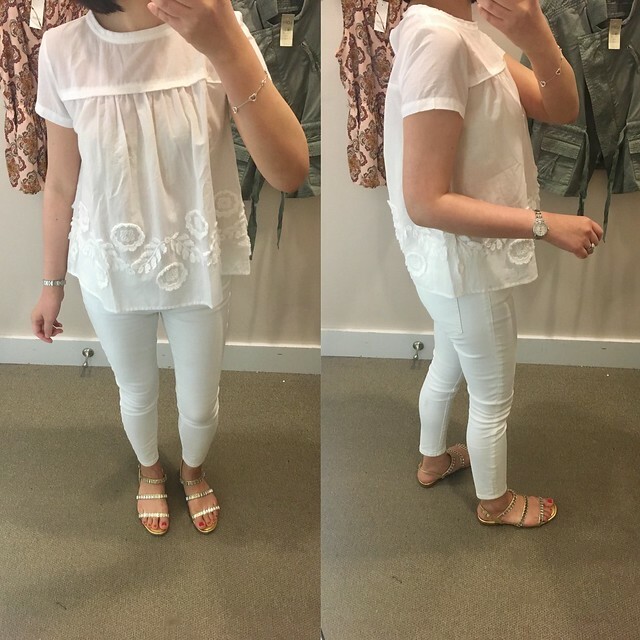 I tried on size XSP in store as reviewed in this post so I knew I would prefer size XXS for the extra length. See this outfit on me here.The shoulders and chest run narrow so you may want to size up for more comfort. 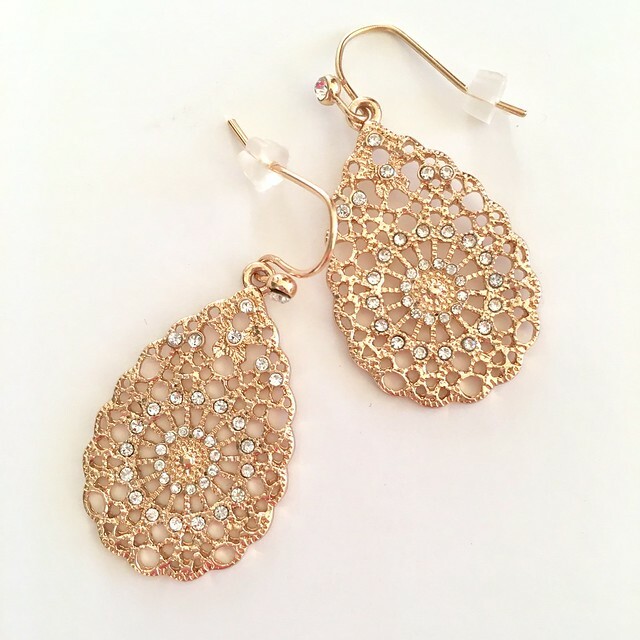 I finally received these filigree earrings after ordering them for the second time during the recent flash sale with free shipping. These earrings were the first link I checked right when their site came back from being down for a day so it was meant to be. I love a comfortable dress and I just had to have this one due to the stripes and adorable bow detail in the back. Check my my full review here comparing size XSP with size XS regular. I ended up repurchasing the gold beaded slides in the next size up since my usual size became very tight on my right foot (the wider foot) after a lot of walking. I’m a wimp when it comes to breaking in shoes but the larger size was just slightly wide enough to fit my feet a lot better. I also received this peony top after much online stalking when size XXS regular popped back in stock. I prefer this outfit with white shorts rather than the white jeans pictured above. My Ann Taylor flash sale picks arrived quicker than expected. I love this flounce hem tank in white but the green one felt more snug even though I ordered both in size XXS regular. It fits true to size but in order for this top to work under my blazers I need to exchange it for size XSP for a slightly shorter length. I don’t like it when my tops stick out from the back of my blazers. Since I wear a lot of silver and white gold I decided to get the pearlized flower pendant in silver even though I have the set in gold. 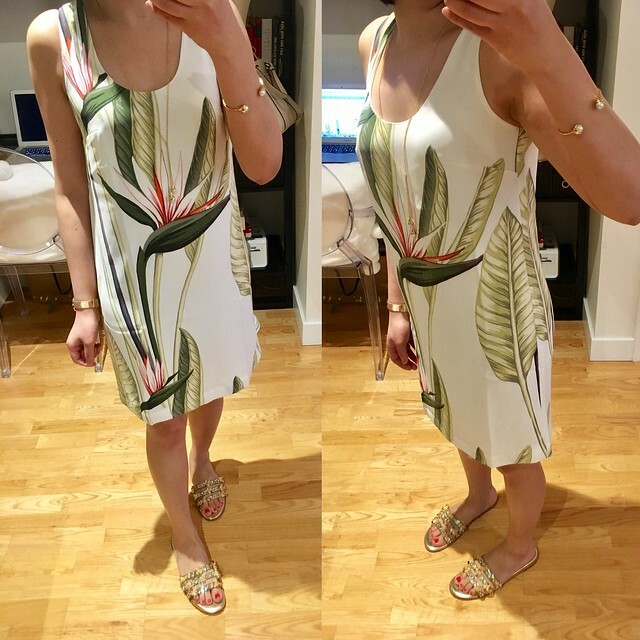 I really wanted to love this tropical tank dress but the print is too large for my preference. The dress is cut very straight up and down so when I tried to sit (always make sure to do the sitting test) it pulled at my hips. You may want to try to size up for comfort but I am passing on this dress because the bust would be too loose on me in a larger size. Refer to this clip for another view of the fit on me. 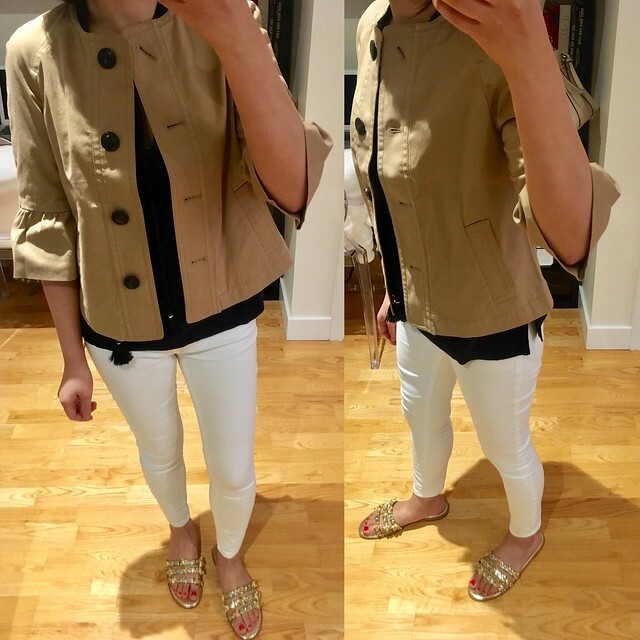 I was hoping to love this safari jacket but it’s not a must have for me due to the oversized buttons. I wish it was a lighter and more neutral khaki color. One plus is that it has functional pockets that you have to free open with a seam ripper. I ordered size XXSP which fits like size XSP. 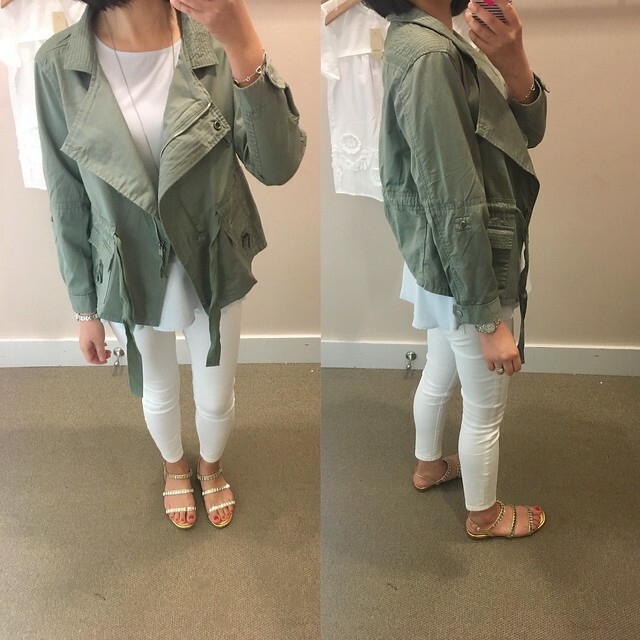 I would have preferred it if the jacket had a more cropped overall length since it would have been easier to pair over my spring and summer dresses. It’s actually slightly longer in the front than back if you attempt to button it so it looks best unbuttoned. The current length is a bit awkward with my tops unless I tuck them in. Right now the deal queen in me wants to keep it only because I got it for 60% off retail but I need another jacket like I need another hole in my head. 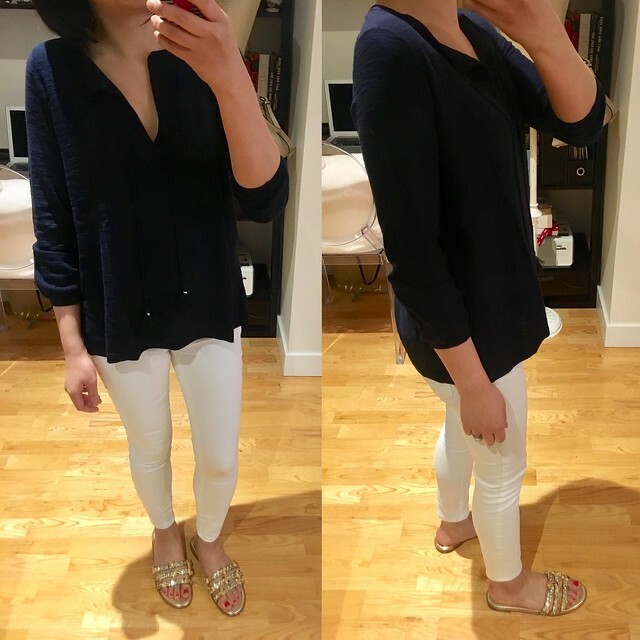 I love this tasseled sweater and I got it in size XXS regular after trying on size XS in store (as reviewed in this post). The v-neck is low but I plan to wear it with a cami underneath for more coverage. Su @allaboutloft tried on this top and I tried it on too out of curiosity. I love this medallion print against white jeans. I tired on size XS which fit true to size so I would prefer my usual size XXS for a better fit. It’s made of a polyester material that feels like silk. It’s also available in solid colors here. Update 10/23: This top is now available in rustic red for the fall. 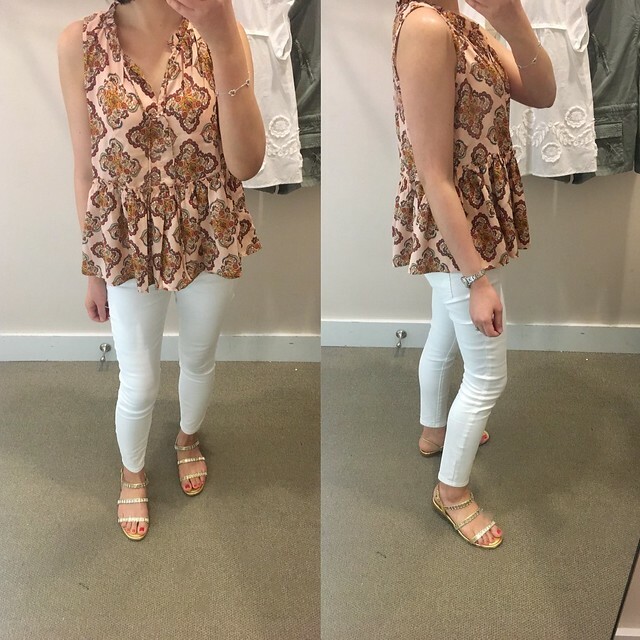 I tried on this adorable top in size XXSP in this post and I tried it on again in size XSP for comparison. It was a better length in the larger size but it was too wide and tent-like on me. If you must have this top a cardigan or jacket over this top will easily hide how wide it is. I love the color of this cargo jacket but the sizing is generous since size XSP felt two sizes bigger. You can see it on Leanne @stylebyleanne here.